Tiger Woods admitted it was "beyond special" to be set for an eighth Ryder Cup appearance after being named as a wild card by US captain Jim Furyk. Furyk sprung no surprises as he selected Bryson DeChambeau, Phil Mickelson and Woods as his first three wild cards, the trio having finished ninth, 10th and 11th in qualifying respectively. "I made my first team at Valderrama and it was a great learning experience to see the passion that one of our late, great team leaders in Payne Stewart showed for the event," Woods said. "He made me understand how important the Ryder Cup is and from that moment on I always wanted to be part of each and every team. "I haven't been part of the team playing-wise for six years. I served as vice-captain a couple of years ago and that was absolutely incredible to be part of the team, to try to help these young guys in any way I could. This year, to be able to play again is beyond special." 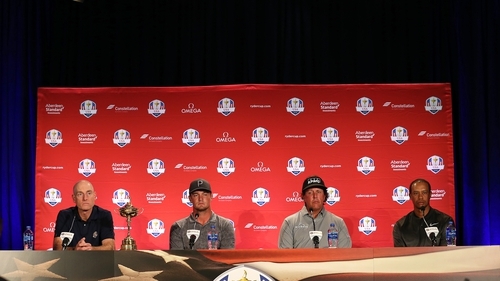 "Tiger and I spent time as partners, we've spent a lot of time as vice-captains talking strategy, talking pairings," Furyk said. "It's been great to have his help and get a little feel of one of the best minds in the history of the game on your side, helping you out. "We're all excited to see him healthy again. It's a feather in our cap to have him playing on our side."